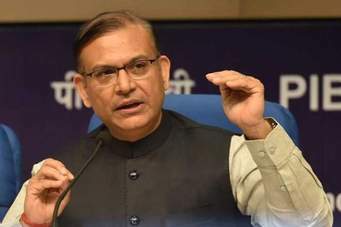 CIVIL Aviation (MoS) Minister Jayant Sinha said on September 26 that discussions on a bailout package for national carrier Air India are at an "advanced stage." Centre has been working on a package for Air India after plans to sell a majority stake in the debt-laden airline failed on May 31 due to a lack of interest from bidders. "We are going through the government approval process," Sinha told reporters, without giving details. with help from taxpayers, has asked the government for Rs 21.21 billion rupees in additional equity to pay the carrier's bills to vendors. Jet Airways, India's largest full-service carrier, and state-owned Air India are struggling to stem losses in the world's fastest-growing domestic aviation market, where competition is intense and fuel taxes are high. India's airline industry is forecast to lose up to $1.9 billion this financial year due to rising costs and low fares, according to consulting firm CAPA. The civil aviation ministry has proposed other measures to help the airline industry, including adding aviation turbine fuel to a nationwide goods and services tax, Sinha said.The government is working on restructuring national Air India’s finances to ensure that the airline has “sustainable debt”, Economic Affairs Secretary Subhash Chandra Garg said. The debt burden of the national carrier, which is grappling with tough business conditions, is estimated to be more than Rs 50,000 crore. Earlier this year, the government’s efforts for strategic disinvestment of debt-laden Air India failed to take off. “What government is doing in Air India is to restructure the finance of Air India in a way that Air India is there with a sustainable level of debt. Whatever is the excess unsustainable debt (it) will be taken out… Air India with sustainable debt will work as a viable entity,” Garg told a news agency. He added that the airline’s unsustainable debt would have to be placed in some special purpose vehicle. After the proposed strategic disinvestment of Air India did not find any takers in May, the government has been looking at ways, including sale of non-core assets, to bolster the carrier’s fortunes. Air India is staying afloat on a bailout package extended by the previous UPA regime in 2012. In the current financial year, the airline has received an equity infusion of Rs 650 crore up to June. A Turnaround Plan (TAP) as well as a Financial Restructuring Plan (FRP) were approved for Air India by the previous UPA regime in 2012. Under these plans, the airline is to get budgetary support amounting to Rs 30,231 crore over a ten-year period and also equity support for the payment of principal/ interest of the non-convertible debentures. So far, the airline has received more than Rs 27,000 crore worth equity infusion.